One of the things I really wanted to do was put my feet on the ground. I didn’t want to see the West from an airplane window, and I certainly didn’t want to drive through it catching only glimpses. I wanted to walk it. So we stopped the car outside of Loveland, CO to hike along a trail called the Devil’s Backbone as storm clouds kicked up over the Rockies. I hiked a piece of Yellowstone through a grassy valley partway up to a place called Observation Peak, and the stillness of the air and the warmth of the ground were something to be felt as we looked out over mountains and forests as far as we could see. It was backcountry. Thank God. Inside, though, I was hankering for a longer hike, something to really sink my teeth into. 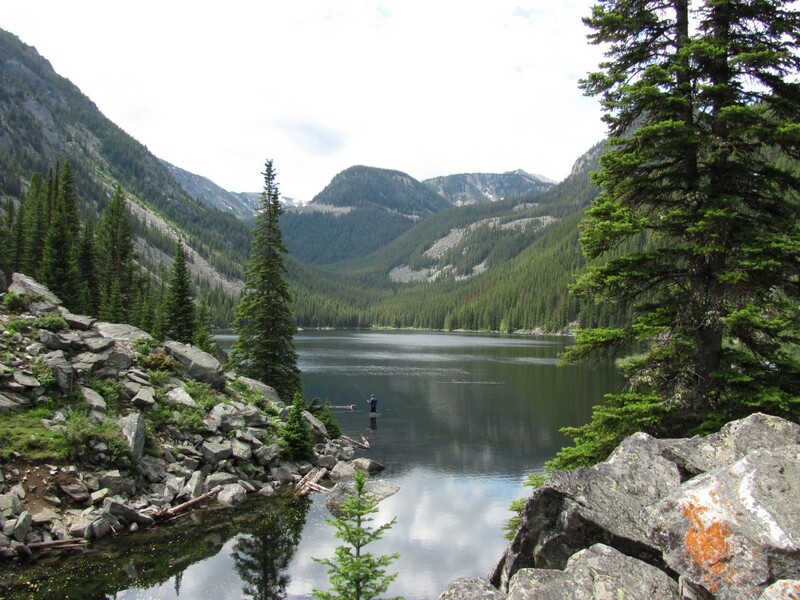 My dad and I settled on a trail called Lava Lake outside of Bozeman that led up through the Spanish Peaks (in the Gallatin Range of the Rockies). When I say picturesque, I mean hiking out of a fairy tale – Cascade Creek that runs alongside the trail almost the entire three miles it climbs the mountain. Birds singing. Flowers blooming along the path, and the scent of pine trees and recent rain in the air. At the lake, the trees opened up and the water spread out quiet and blue, with an occasional ripple as a fish surfaced. We heard the hiss of line as two fly fisherman cast. More peaks behind the lake, a little pica scrambling on the rocks below us. An eagle swooped in over the water and came up with its talons empty, its shadow gray over the lake. There were other trails out there too, with names like Hellroaring and Storm Castle. For now, these are the road not taken. Not yet. So enjoying all your posts, Amy. Love your sensitivity to the language of the materials you're quoting. Thank you, Richard, and thank you for reading! The 1880s coroners' inquests for Lawrence County, SD (including the notorious Deadwood) made for some pretty grim yet colorful reading as well.